It seems like every week now we have news of great suffering, from forest fires to mass shootings to plane crashes. It’s hard to listen to the stories and to think of those who died tragically, especially as many of us live undisturbed, comfortable lives. Then, to imagine that there are some who have chosen to suffer for the sake of their faith, this can shake us. They are the martyrs, literally witnesses, to the Christian faith; and their witness should wake us during this Lent. In his sermon, “Martyrdom,” Blessed John Henry Newman helps us understand the nature of the martyr’s sacrifice and its effect on us. 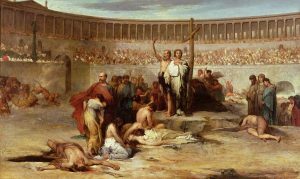 Though there have been martyrs all throughout Christian history, including today, Blessed Newman looks to the martyrs of the early Church for his examples. The suffering and death of these martyrs was as foreign to ancient culture as it is to our own for two reasons. First, their suffering was voluntary. They lived their lives with warnings of persecution, threats of torture if they continued in the Way, and daily anxiety over their own safety and the safety of their loved ones. Their fears were compounded by temptations to abandon the faith, and pressure from those who did abandon it to join them. Newman imagines the mental state of the faithful during these times: “They sigh for peace; they gradually come to believe that the world is not so wrong as some men say it is, and that it is possible to be over-strict and over-nice. They learn to temporize and to be double-minded. First one falls, then another; and such instances come as an additional argument for concession to those that remain firm as yet, who of course feel dispirited, lonely, and begin to doubt the correctness of their own judgment; while, on the other hand, those who have fallen, in self-defence become their tempters.” When they finally came to the end, “Death, their final suffering, was but the consummation of a life of anticipated death,” Newman says. Blessed Newman points out that we may know of people who have suffered worse through disease or accident, or those who have endured trials and death against their will, and yet it is quite another thing to walk voluntarily into tribulation. We must not confuse this attitude with suicide, in which despair of living overcomes the desire to live. 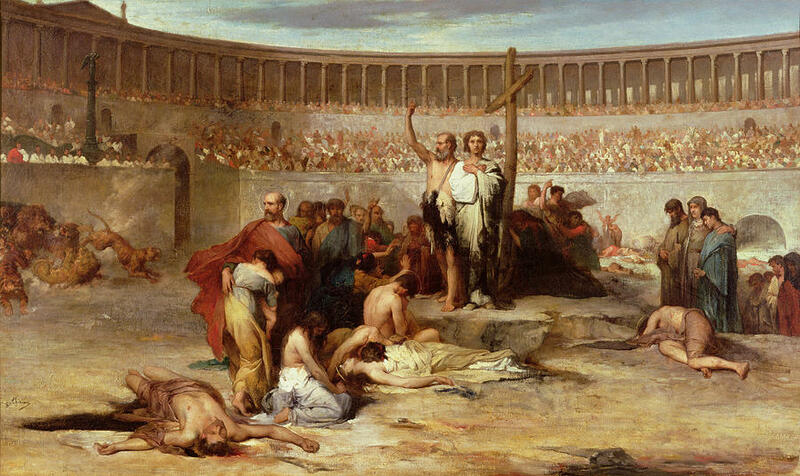 These martyrs knew the value of their lives, but they forfeited them because something was more valuable – that is, love of God and their fellow men. Rather than deny their Lord, they chose to witness to His consuming love, which was more real than the fire that consumed them. Tertullian, writing in the second century, said, “the blood of the martyrs is the seed of the Church.” Their witness showed the world that there is something, or rather Someone, whose love is greater than life itself. Lent is the perfect time for humility. By our prayer, fasting, and charity, we hope to imitate our Lord and these great saints who were motivated by love. We should not miss this opportunity to tell Our Lord that although we have so little to offer Him, we want to offer him more each day, to say yes to His every prompting. Do not forget to ask for the intercession of these great saints who were sinful men and women like us, but who let God use them mightily. Hello Father, I am not sure if this is only me and my computer but I can’t seem to listen to anything except that which I first listened to today… Idea of University Part 2. I will have to come back later to see if I can break through to the rest. Thank you Carrie. We will try to correct this. For the moment I will remove the mistaken audio link.